Once students know the procedure, they should stop counting and memorize! When it comes to math facts like 9 plus 7 or 8 times 6 there are only two things to know. 1) A procedure to figure it out, which shows that you understand the “concept.” 2) What’s the answer? It is important for students to understand the concept and to have a reliable procedure to figure out the answer to a math fact. But there is no need for them to be required to use the laborious counting process over and over and over again! Really, if you think about it, even though this student is doing his math “work” he is not learning anything. Math teaching strategy: Go ahead and memorize those facts. Rocket Math: Because going fast is more fun! Memorizing facts is the lowest level of learning. It’s as easy as it gets. But memorizing ALL the facts, which are similar, is kind of a long slog. Some kids just naturally absorb the facts and memorize them. 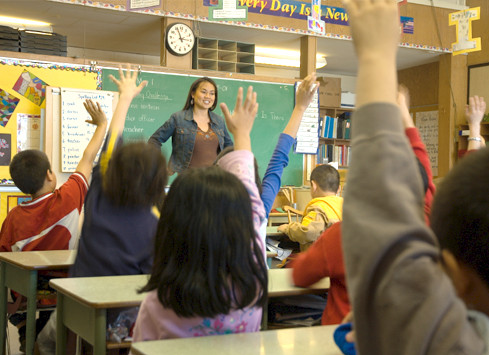 Math teaching strategy: Find a systematic way for students to memorize. A lot of students don’t learn the facts and keep counting them out over and over again. They just need a systematic way of learning the facts. Students need to spend as much time as necessary on each small set of facts to get them fully mastered. If the facts are introduced too fast, they start to get confused, and it all breaks down. Each student should learn at their own pace and learn each set of facts until it is automatic–answered without hesitation and without having to think about it. This can be accomplished by everyone, if practice is carefully and systematically set up. It should be done, because the rest of math is either hard or easy depending on knowing those facts. And don’t get me started about why equivalent fractions are hard! Rocket Math can make learning math facts easy. But even more important it can make teaching computation easy too! One of the first teachers to field test Rocket Math was able to teach addition facts to her first grade class, and then loop with them into second grade, where she helped them master subtraction facts as well. She told me that because her second graders were fluent with their subtraction facts, they were ALL able to master regrouping (or borrowing) in subtraction in three days. What had previously been a three week long painful unit was over in less than a week. All of them had it down, because all they had to think about was the rule for when to regroup. None of them were distracted by trying to figure out subtraction facts. Math teaching strategy: Get single-digit math facts memorized before trying to teach computation. When math facts aren’t memorized, computation will hard to learn, hard to do, and full of errors. When math facts aren’t memorized, computation will be hard to learn. I used to think computation was intrinsically hard for children to learn. Because it was certainly hard for all of my students with learning disabilities. 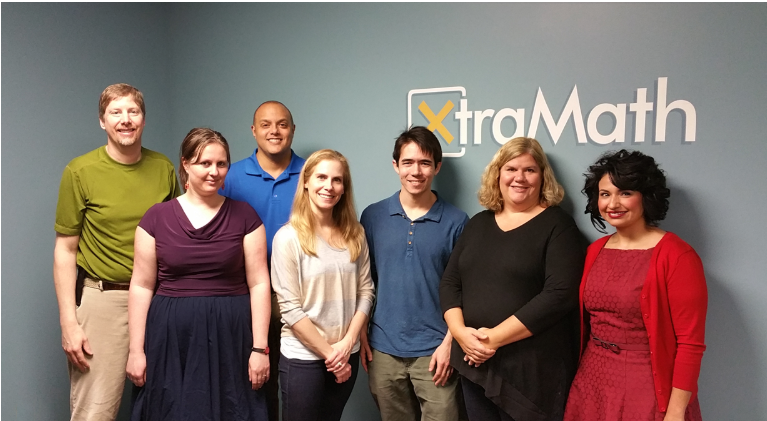 But none of them had memorized the basic math facts to the point where they could answer them instantly. 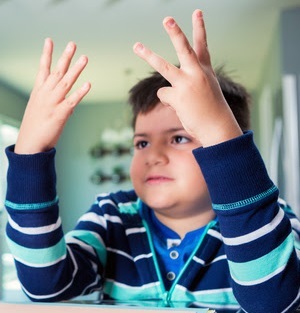 They always had to count on their fingers for math. When I learned more about the process of learning, I found out that weak tool skills, such as not knowing math facts, interferes with learning the algorithms of math. 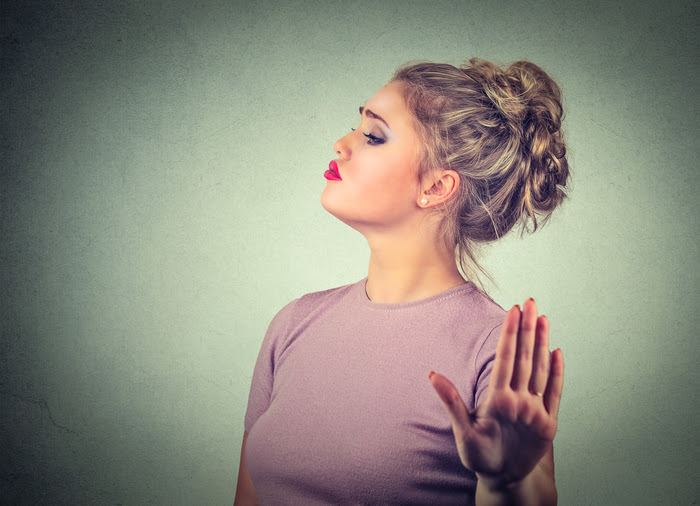 When the teacher is explaining the process, the student who hasn’t memorized math facts is forced to stop listening to the instruction to figure out the fact. When the student tunes back into instruction they’ve missed some essential steps. Every step of computation involves recalling a math fact, and if every time the learner has to turn his/her attention to deriving the math fact they are constantly distracted. That interferes with the learning process. When math facts aren’t memorized, computation will be hard to do. 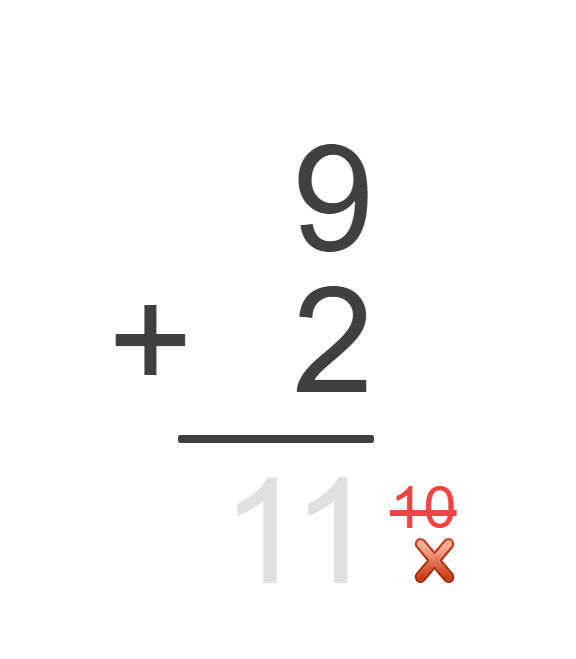 Having to stop in the middle of the process of a multi-digit computation problem to “figure out” a fact slows students down and distracts them from the process. It is easy to lose your place, or forget a step when you are distracted by the difficulty of deriving a math fact or counting on your fingers. It is hard to keep track of what you’re doing when you are constantly being distracted by those pesky math facts. And of course, having to figure out facts slows everything down. I once stood behind a student in a math class who was doing multiplication computation and when he hesitated I simply gave him the answer to the math fact (as if he actually knew them). He loved it and he was done with the small set of problems in less than half the time of anyone else in his class. Children hate going slow and slogging through computation. Conversely, when they know their facts to the level of automaticity (where the answers pop unbidden into their minds) they can go fast and they love it. That’s why “Because going fast is more fun!” is the Rocket Math tag line. When math facts aren’t memorized, computation will be full of errors. 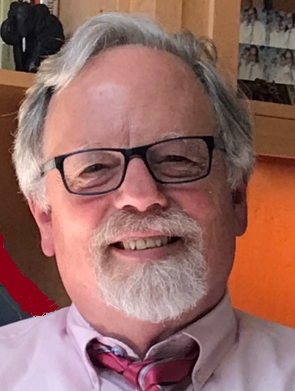 When I learned more about basic learning, I found out that the frequent student errors in computation were not simply “careless errors.” I thought they were because when I pointed out simple things like, “Look you carried the 3 in 63 instead of the 6.” my students would always go “Oh, yeah.” and immediately correct the error. If I asked them they knew that they were supposed to carry the number in the tens column, but they didn’t. I thought it was carelessness until I learned that such errors were the result of being distracted. Not by the pretty girl next to you, but by having to figure out what 7 times 9 was in the first place. After going through the long thinking process of figuring out it was 63 they were so distracted that they carried the wrong digit. Not carelessness but distraction. Once students instantly know math facts without having to think about it, they can pay full attention to the process. They make far fewer errors. In short, don’t be cruel. If you have any autonomy available to you, first help your students memorize math facts and then teach them how to do computation in that operation. 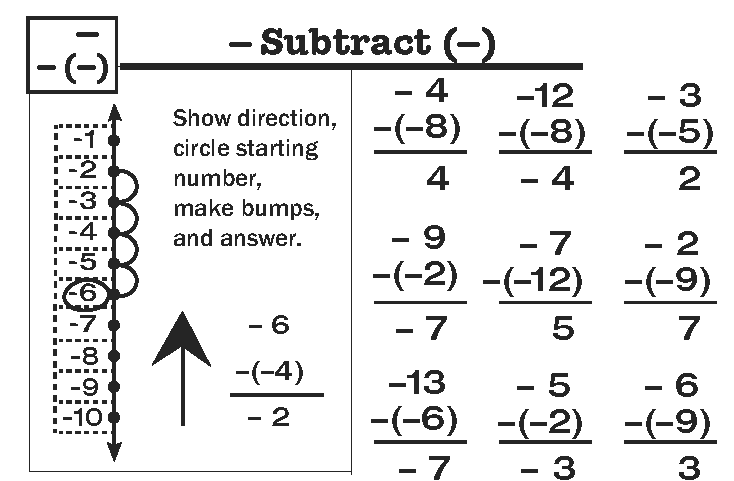 In other words, teach subtraction facts before subtraction computation. If you help them get to the point where math fact answers in the operation come to them without effort, you’ll be amazed at how much easier it is to teach computation, for them to do it and at the accuracy with which they work. At first, it may seem like the way Rocket Math presents the same simple facts over and over, is so easy it must be a waste of time. But like anything you learn, you have to start where it seems easy and then build up to where it is hard. Rocket Math has been effective helping students learn their math facts for over 20 years. It is designed according to scientifically designed learning principles, which is why it works, if students will work it. 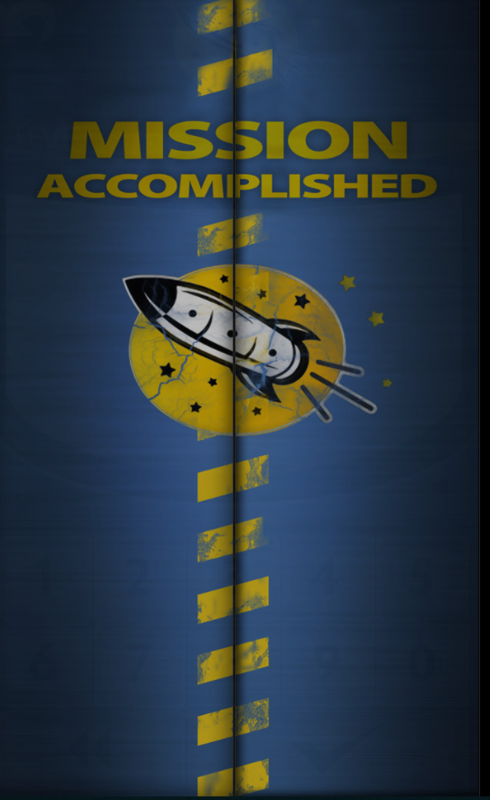 Rocket Math carefully and slowly introduces facts to learn in such a way that students can achieve fluency with each set of facts as they progress through the alphabet A through Z. Let me explain. Set A begins with two facts and their reverses, e.g., 2+1, 1+2, 3+1 and 1+3. Dead simple, huh? But in answering those the student learns what it is like to instantly “know” an answer rather than having to figure it out. 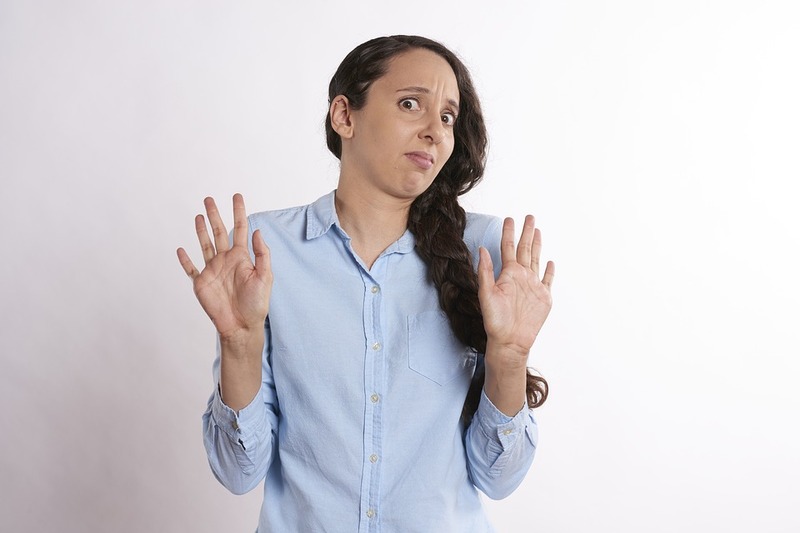 The student says to himself or herself, “Well, I know that one.” The student learns he or she can answer a fact instantly with no hesitation every time based on recall and not figuring it out. 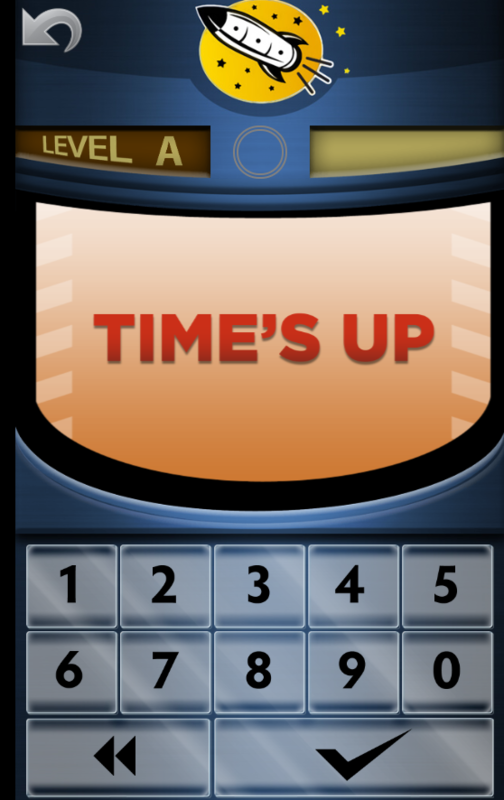 The game requires the student to answer the problems at a fast rate, proving that he or she knows those facts. 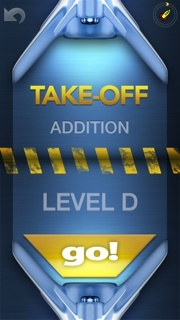 Once that level is passed the game adds two more facts and their reverses,. The same process of answering them (and still remembering Set A) instantly with no hesitation every time. When that is achieved, the game moves the student on to Set C, two more facts and their reverses. 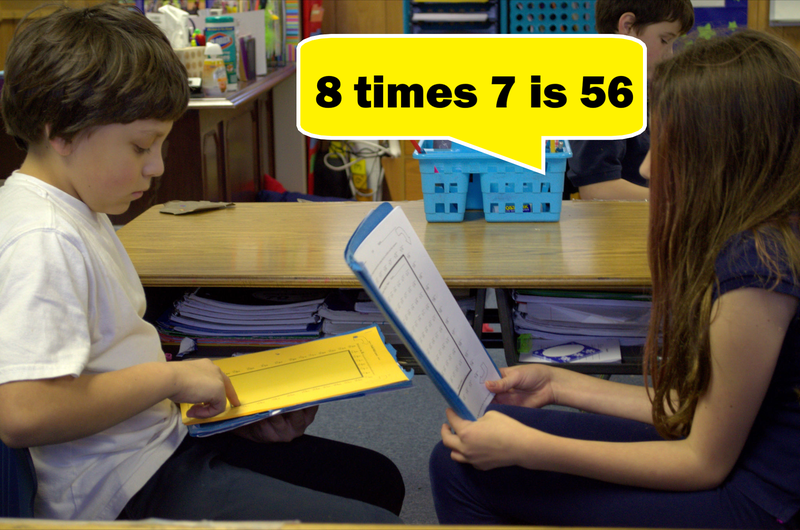 Eventually, every student gets to a fact on which they hesitate (maybe one they have to count on their fingers), meaning they can’t answer within the 3 seconds allowed. Mission Control then says the problem and the correct answer, has the student answer that problem, then gives two different facts to answer and goes back to check on the fact the student hesitated on again. If the student answers within 3 seconds then the game moves on. In the Take-Off phase the student is introduced to the two new facts and their reverses. That’s all the student has to answer. But the student has to answer each one instantly. If the student is hesitant on any of those facts (or makes an error) then they have to Start Over and do the Take-Off phase over again. They have to do 12 in a row without an error or a hesitation. Once the Take-Off phase is passed the student goes into the Orbit phase, where there is a mix of recently introduced facts along with the new facts. The student has to answer up to 30 facts, and is allowed only two errors or hesitations. After the third error or hesitation the student has to Start Over on the Orbit Phase. Once the Orbit phase is passed, the student goes on to the Universe phase, which mixes up all the facts learned so far and presents them randomly. Again the student has to do up to 30 problems and can only hesitate on 2 or them or he or she has to start over. But once the student proves that all of those facts can be answered without hesitation, the game moves on to the next level, introducing two more facts and their reverses. In the Worksheet Program, students practice with a partner. In the Online Game the student practices with the computer. 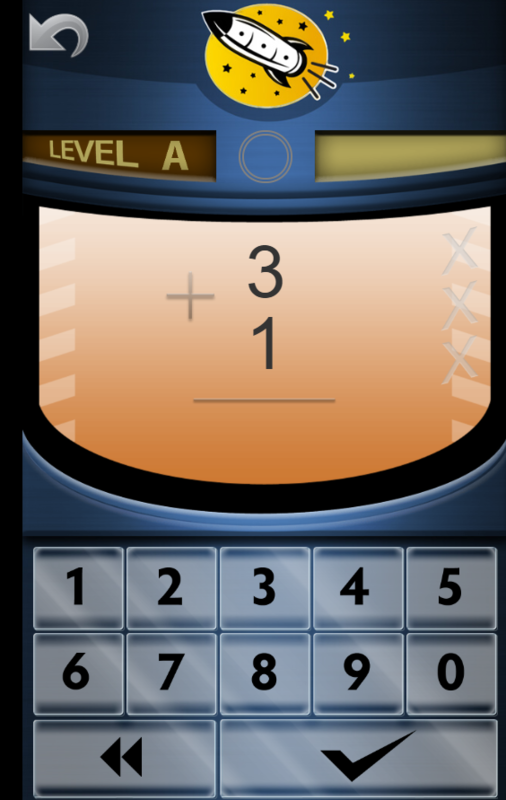 In both versions of Rocket Math the students follow the same careful sequence and slowly, but successfully build mastery of all of the facts in an operation. It’s hard work and takes a while, but we try to make it fun along the way. It will work for everybody, but not everybody is willing to do the work. At least, now you understand how Rocket Math is designed so it can teach mastery of math facts. What if teachers won’t do Rocket Math? Don’t argue, just prove it works! How can we encourage the teacher who refuses rocket math and administration does not reinforce (or enforce) the program’s use? This is a great question. Frankly, one of the most annoying things I found during my time as a teacher were the constant “new” fads. I got sick and tired of being told to do things I knew would not work. I don’t blame people for being skeptical or an administration that won’t go to bat for a new curriculum. I think it is the responsible thing to do. Which is why schools should test everything for themselves, which isn’t that hard to do. Prove to yourself it works with your students in your school with your staff. Then you know it is worth doing. Only then do you have a responsibility to reinforce the program’s use, only after it is proven. Just use those 2-minute timings as pre and post tests and see if there is anything that will beat Rocket Math. Any teacher worth their salt should want to use a curriculum that is effective and helps students learn. I have the following standing offer on my website. If any school will conduct research comparing Rocket Math to some other method of practicing math facts and share your results–I will refund half of the purchase price of the curriculum. If a school finds some other method is more effective, I will refund 100% of your purchase price. Using a vertical number line can help provide certainty. The first issue for students is just to be certain of the answer. A vertical number line, where “up” is more and “down” is less helps provide certainty. 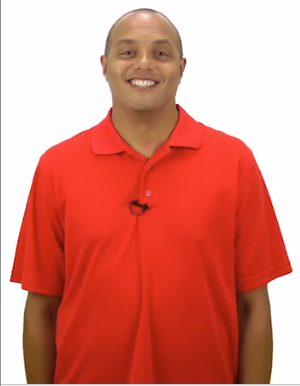 I have posted a series of free lessons online (links below) that use a vertical number line and a consistent procedure to take the confusion out of the process. All eight types of problems can be solved with the same process on the vertical number line. Using the vertical number line there are two rules to learn. Rule 1: When you add a positive or subtract a negative you go up on the number line. 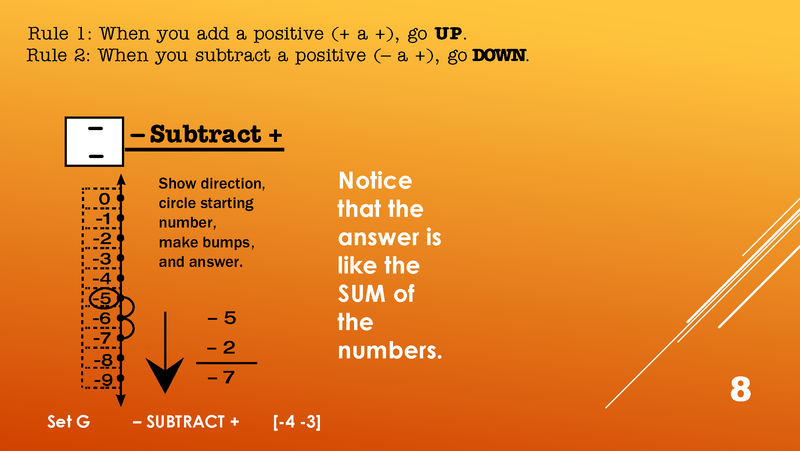 Rule 2: When you subtract a positive or add a negative you go down on the number line. So first thing to figure out is what you are being asked to do (add or subtract a positive or a negative) and then use the rule to tell you whether whether you’re going up or down. Next step in the procedure is to circle the starting point on the number line. Once you circle the starting point, you show how far you’re being asked to go. You simply make the right number of “bumps” going either up or down from where you start. That gives you the answer without any uncertainty. 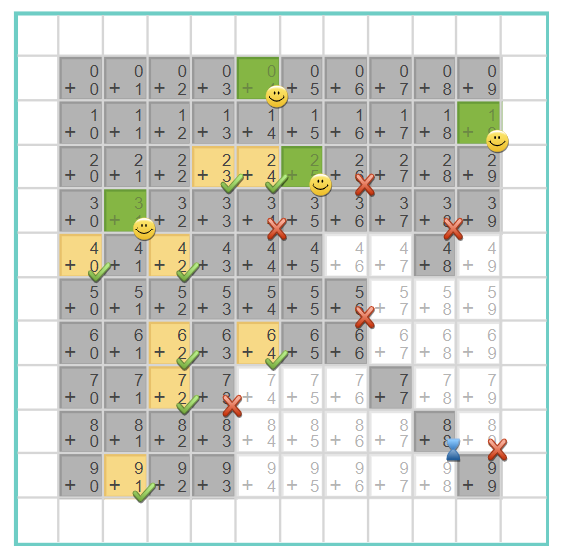 These online lessons are quick (about 2 minutes) and identify a pattern of whether the answer is like the sum or the difference between the numbers. Once students can recognize the pattern they can begin to answer fluently and without a struggle. 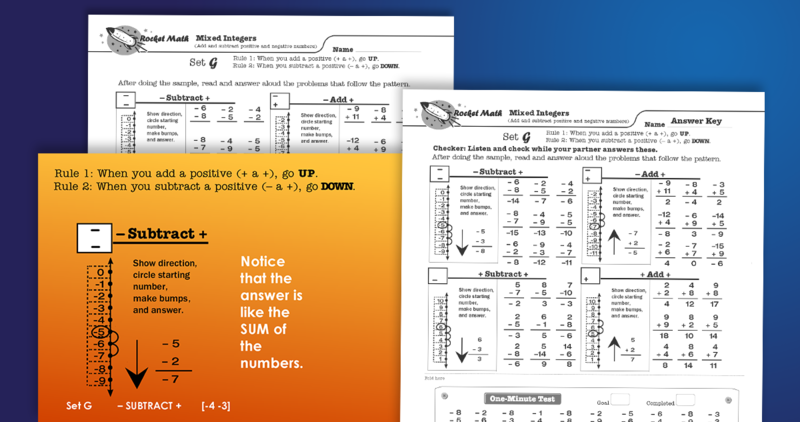 Here is a part of a page from the Mixed Integers learning track. The paired practice part of the program helps students learn to quickly and easily recognize each pattern. First students use the vertical number line to work a problem. In this example: -6 minus (-4). Then they have a set of problems with the same pattern (a negative subtracting a negative) which they should be able to orally answer without having to use the number line. Each worksheet includes all the types learned so far in the learning track. As with all Rocket Math programs there is a 2 to 3 minute practice session (at this level I’d recommend 3 minutes), with a partner. Then the two switch roles. The practice is followed by a one-minute test. If the student can answer the problems in the test fluently (essentially without hesitations) the level is passed. As always, the students goals are individually determined by a Writing Speed Tests. 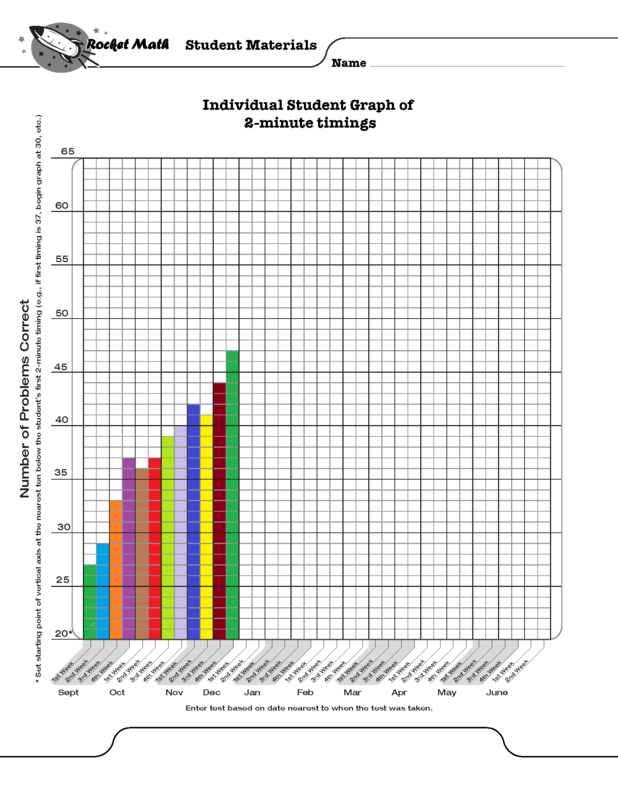 If a given level is still difficult the student stays with that level a bit longer. When a new pattern or type of problem is first introduced the one-minute tests will have a whole row of problems that are the same pattern. When that level is passed the next test will have two types of problems in each row. The next level has 3 types in a row, culminating in the fifth level where the problem types are mixed. This way the student develops fluency in recognizing the type of problem and how to derive the answer quickly. The Learning to Add Integers and Learning to Subtract Integers learning tracks take more time to learn the patterns, while Mixed Integers moves more quickly. Don’t forget that Rocket Math has a money-back guarantee. So if this doesn’t work for you and your students we will refund your subscription price. Are your students wary of working with integers? Many students find integers confusing. If you add a negative to a negative are you getting more or less??? Over the years different “rules” have been used to try to remember what should happen. 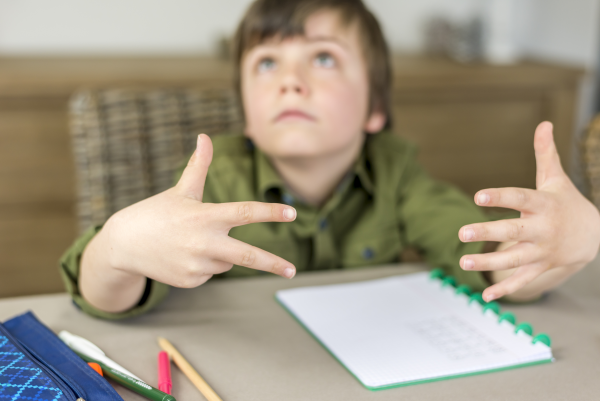 Rules such as “two negatives make a plus” or “opposite signs subtract.” Whatever is used to try to remember, it interferes with a student’s ability to quickly and reliably get the answers without having to stop and puzzle it out. I have posted a series of free lessons online (links below) that use a vertical number line to take some of the confusion out of the process. Turns out there are a total of eight types of problems but all of them can be solved with the same process on the vertical number line. Intuitively on a vertical number line, up is more and down is less. Using the vertical number line there are two rules to learn. Rule 1: When you add a positive or subtract a negative you go up on the number line. 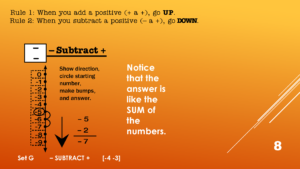 Rule 2: When you subtract a positive or add a negative you go down on the number line. So first thing to figure out is whether you’re going up or down. Once you do that you simply make “bumps” going either up or down from where you start. That gives you the answer without any uncertainty. These lessons are quick (about 2 minutes) and identify a pattern of whether the answer is like the sum or the difference between the numbers. Once students can recognize the pattern they can begin to answer fluently and without a struggle. 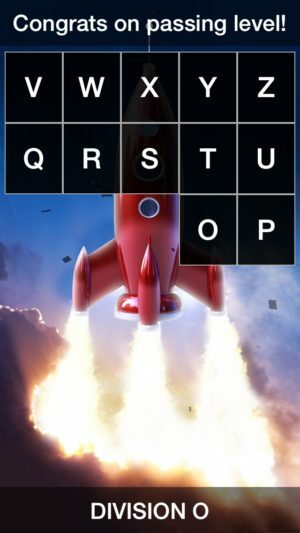 To help with the work of learning to quickly and easily recognize each pattern in Integers Rocket Math now includes a “Mixed Integers” program in our Universal Subscription. (Click here to get a 60-day trial subscription for $13 –rather than the standard $49 a year.) Students use the vertical number line to work a problem. In this example: -6 minus (-4). Then they have a set of problems with the same pattern they can orally answer without having to use the number line. As with all Rocket Math programs there is a 3 minute practice session, with a partner. Then the two switch roles. Then the practice is followed by a one-minute test. If the student can answer the problems without hesitations the level is passed. If it is still difficult the student stays with that level a bit longer. When a new pattern is introduced the tests will have a whole row of problems that are the same pattern. When that level is passed the next test will have two types of problems in each row. The next level has 3 types, then 4 types in each row. Then the problem types are mixed. This way the student develops fluency in recognizing the type of problem and how to derive the answer quickly. Rocket Math has a money-back satisfaction guarantee. If you try this and find it isn’t everything you hoped, in terms of helping your students become fluent with integers, I’ll gladly refund your money. I’m betting they’re going to love it. Knowing when you’ve found ALL the factors is the hard part. 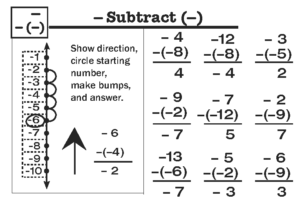 Students have to learn how to find the factors of a number because several tasks in working with fractions require students to find the factors of numbers. Thinking of some of the factors of a number is not hard. 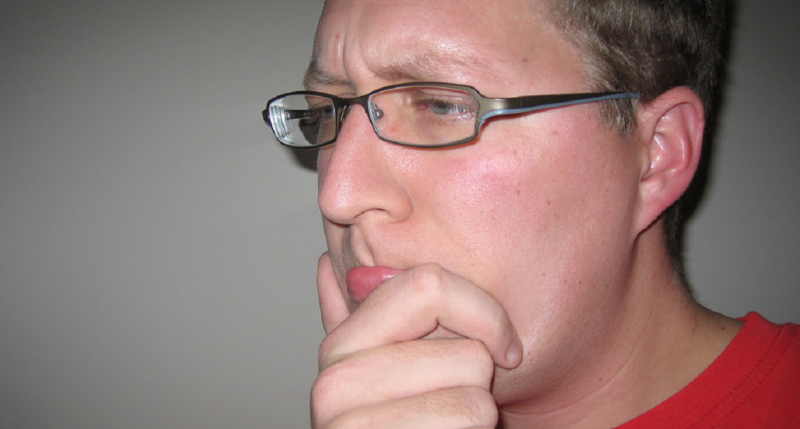 What is hard is knowing when you have thought of ALL the factors. Here is a foolproof, systematic method I recommend: starting from 1 and working your way up the numbers. This is what student practice in the Rocket Math Factors program. Bookmark this link so you can show it to your students. Always begin with 1 and the number itself-those are the first two factors. You write 1 x the number. Then go on to 2. Write that under the 1. If the number you are finding factors for is an even number then 2 will be a factor. Think to yourself “2 times what equals the number we are factoring?” The answer will be the other factor. However, if the number you are finding factors for is an odd number, then 2 will not be a factor and so you cross it out and go on to 3. Think to yourself “3 times what equals the number we are factoring?” There’s no easy rule for 3s like there is for 2s. But if you know the multiplication facts you will know if there is something. Then you go on to four—and so on. The numbers on the left start at 1 and go up in value. The numbers on the right go down in value. You know you are done when you come to a number on the left that you already have on the right. Let’s try an example. We start with the first two factors, 1 and 18. We know that one times any number equals itself. We write those down. Next we go to 2. 18 is an even number, so we know that 2 is a factor. We say to ourselves, “2 times what number equals 18?” The answer is 9. Two times 9 is 18, so 2 and 9 are factors of 18. Next we go to 3. We say to ourselves, “3 times what number equals 18?” The answer is 6. Three times 6 is 18, so 3 and 6 are factors of 18. Next we go to 4. We say to ourselves, “4 times what number equals 18?” There isn’t a number. We know that 4 times 4 is 16 and 4 times 5 is 20, so we have skipped over 18. We cross out the 4 because it is not a factor of 18. Next we go to 5. We might say to ourselves, “5 times what number equals 18?” But we know that 5 is not a factor of 18 because 18 does not end in 5 or 0 and only numbers that end in 5 and 0 have 5 as a factor. So we cross out the five. We would next go to 6, but we don’t have to. If we look up here on the right side we see that 6 is already identified as a factor. So we have identified all the factors there are for 18. Any more factors that are higher we have already found. So we are done. Now let’s do another number. Let’s find the factors of 48. We start with the first two factors, 1 and 48. We know that one times any number equals itself. Next we go to 2. 48 is an even number, so we know that 2 is a factor. We say to ourselves, “2 times what number equals 48?” We might have to divide 2 into 48 to find the answer is 24. But yes 2 and 24 are factors of 48. Next we go to 3. We say to ourselves, “3 times what number equals 48?” The answer is 16. We might have to divide 3 into 48 to find the answer is 16. But yes 3 and 16 are factors of 48. Next we go to 4. We say to ourselves, “4 times what number equals 48?” If we know our 12s facts we know that 4 times 12 is 48. So 4 and 12 are factors of 48. Next we go to 5. We might say to ourselves, “5 times what number equals 48?” But we know that 5 is not a factor of 48 because 48 does not end in 5 or 0 and only numbers that end in 5 and 0 have 5 as a factor. So we cross out the five. Next we go to 6. We say to ourselves, “6 times what number equals 48?” If we know our multiplication facts we know that 6 times 8 is 48. 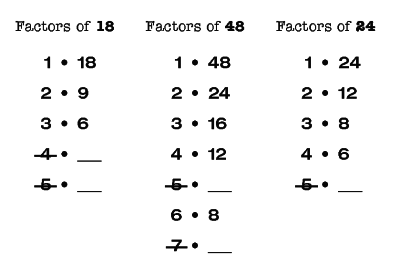 So 6 and 8 are factors of 48. Next we go to 7. We say to ourselves, “7 times what number equals 48?” There isn’t a number. We know that 7 times 6 is 42 and 7 times 7 is 49, so we have skipped over 48. We cross out the 7 because it is not a factor of 48. We would next go to 8, but we don’t have to. If we look up here on the right side we see that 8 is already identified as a factor. So we have identified all the factors there are for 48. Any more factors that are higher we have already found. So we are done. Most people, for example, know their name, by memory. This topic of “know from memory” is something I have been digging into as a special educator. I wonder what your thoughts are about whether certain accommodations from these “know from memory” standards would actually be modifying the curriculum? For example, if we used “extra time to respond” and the student had to use their fingers or some other method to count, would they then not be doing the standard? This relates to where I’m at in middle school math, but I think that it’s reflected in the continuum of the common core maths. The purpose of the verbal rehearsal that is a daily part of Rocket Math is to cement these basic facts in memory. 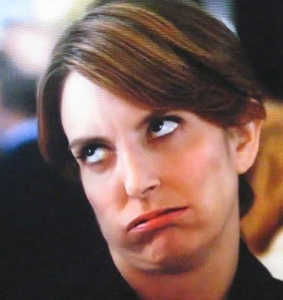 Then when a student says to themselves, “8 times 7 is,” the answer pops into their mind with no effort. It takes quite a bit of practice to achieve that. However, the ability to instantly recall the answers to basic math facts makes doing mathematical computation a relative breeze. It make seeing relationships among numbers very obvious. It makes reducing fractions and finding common denominators easy. That’s why the Common Core thinks “knowing from memory” is so worthwhile. It’s why I began promoting Rocket Math in the first place.